Nestled between the Pacific Ocean and the Santa Ynez mountains lies El Capitan Ranch an incredible beach side canyon resort located fifteen minutes North of downtown Santa Barbara.Built in 2001 El Capitan Canyon offers creek side cabins with full baths and designer tents with down filled comforters wet bar private fire pit just to name a few and an unbelievable back to nature experience.The canyon boasts fifteen miles of backcountry hiking and mountain biking as well as ocean sports kayaking surfing swimming scuba diving fishing and outdoor heated pool.Conference facilities include one of a kind Yurt meeting room that can accommodate from 2 to 200 people.Amenities included in room spa service on site gourmet canyon market seasonal jazz dinner concert series and an extensive childrens program.Come and experience a place so unique so close to nature yet with a level of comfort that is unsurpassed in the realm of outdoor recreating at a truly affordable price. we are a luxury camping resort offering cedar cabins and safari tents and not a traditional hotel. 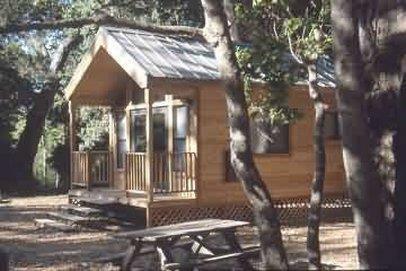 El Capitan Canyon is an outdoor lodging property offering cedar cabins and safari tents and not a traditional hotel. CHEVYS: 7 miles south in the Camino Real Market place Lunch DinnerCasual Tex/Mex Homemade tortillas with great drink and food. KASHIMA SUSHI: 10 miles south near UCSB Lunch DinnerCasualSushi/Japanese A new great sushi place. THE GOOD EARTH RESTAURANT and BAKERY: 10 miles south near UCSB Breakfast Lunch and Dinner CasualCalifornai Cuisine with healthy natural ingreds Great family restaurants and delicious bakery. CULTURAL DISTRICT15 miles south to the property Santa Barbara CA. Museum of Art Museu of Natural History Karpeles Manuscript Library El Presidio Railroad Museum. SANTA BARBAR HARBOR15 miles south to the property Santa Barbara CA.Marina and Historic Stearns Wharf with Martime and Sea Center Musemus shopping restaurants parks. And Sunday beachfront Arts and Craft Market. SANTA BARBARA MISSION15 miles south to the property Santa Barbara CA. Beautiful historic site in the Santa Barabara Foothill with spectacular views. SANTA YNEZ WINERIES15 miles north to the property Santa Ynez CA.Santa Ynez boast dozen of fine wineries and vineyard scattered through out the valley. UNIVERSITY OF CALIFORNIA3 miles south to theproperty Santa Barbara UCSBSanta Barbara California Beautiful beachside campus university.